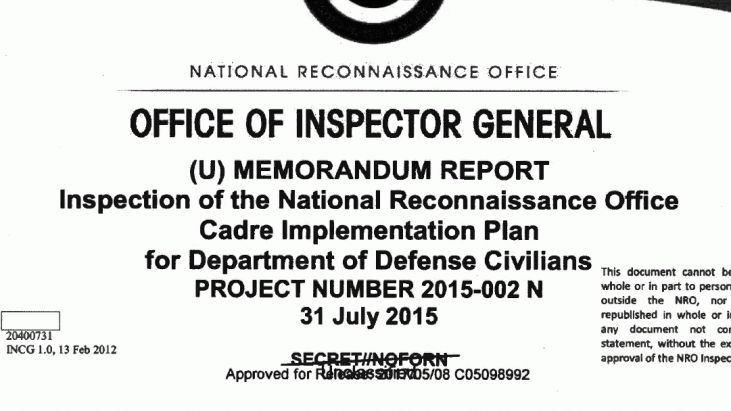 The National Reconnaissance Office (NRO) Office of Inspector General (OIG) completed its Inspection of the NRO Cadre Implementation Plan for Department of Defense Civilians. I am providing this memorandum report for your attention as the NRO strives to establish a permanent NRO Department of Defense (DoD) Cadre on 4 October 2015. The NRO OIG recognized the efforts of the employees supporting the transition, and the resulting success based on those efforts. However, the OIG also identified challenges and deficiencies that may influence the NRO’s ability to meet the 4 October 2015 milestone and/or manage its future workforce. organization’s critical mission. Pursuant to congressional direction (Intelligence Authorization Act (IAA) of Fiscal Year (FY) 2014 and 2015) for the NRO to augment its current staffing model with career service employees, the NRO commenced efforts to establish a permanent NRO DoD Cadre. implementation plan progress reports to Congress. After coordination with the ICIG, it was determined that the NRO OIG would assess NRO’s progress in establishing a permanent NRO DoD Cadre. As the NRO elected to focus initially on the Congressional request for a strategy for transitioning the current Air Force and Navy civilians, the NRO OIG evaluated the Implementation Plan for Creating a DoD Civilian Workforce for the NRO and the transition activities administered by the Workforce Stability Initiative (WSI) NRO DoD Cadre Working Group (WG).